Sure, Give ’em a Call. 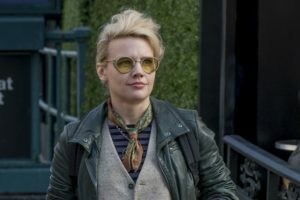 The weird, angry saga that has been the internet reaction to the new version of Ghostbusters has been largely inescapable, with fans taking sides in a strange battle that has whipped together nostalgia, sexism, and the frustrations of fans who suffered through endless hopes of a return of the franchise only to have it finally happen in a way they didn’t want. I like the original film (and even the cartoon show) a lot, and wasn’t thrilled with the idea of a remake but didn’t really have much investment either way. I thought the trailers made it look aggressively mediocre and I didn’t feel I was going to go out of my way to see it. But when free tickets to an early preview fall into your lap, you don’t say no, so I hopped on over to a packed theater and saw a 3D film from the front row, which my neck is scolding me for today. It’s fun! It is a nice, popcorn summer blockbuster that hits the marks of what it set out to do. Is it a classic? No. Is it terrible? No. It’s a fun, summer movie that lives and dies by the chemistry of its cast. (If they work for you, it works. If their humour isn’t yours, it doesn’t.) Everyone should just relax and let it be that. 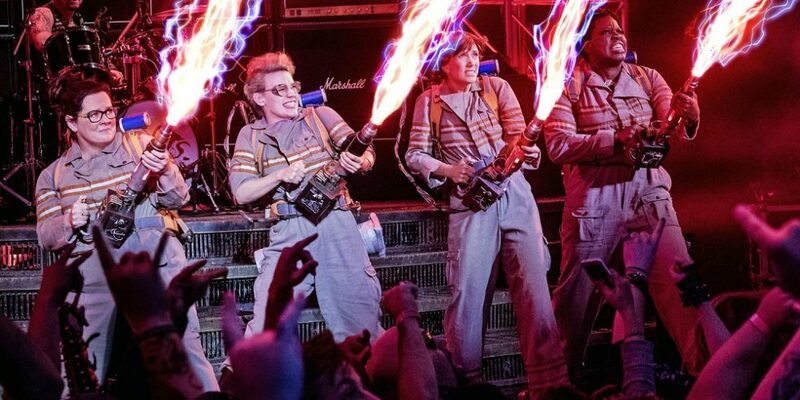 The original Ghostbusters is a fun romp that has a simple plot and mostly just gets out of the way to let the cast be funny. The new one is a fun romp that has a simple plot and is at its best when it just gets out of the way to let the cast be funny. And they are funny. I haven’t been the biggest fan of McCarthy and Wiig, but they are funny people and they play off each other well. Leslie Jones is far better than the trailer’s “generic sassy black woman” showed us, and Chris Hemsworth is clearly just loving playing a silly bimbo. Yes, I have already fantasy cast her as the Doctor. There is no way the interactions of the main crew weren’t going to be compared to the originals, and smartly, the movie doesn’t try to recreate the exact same dynamic. These aren’t the same four characters. They’ve taken some of the same beats – the reluctant one, the enthusiastic one, the brilliant one who out-nerds them all, the non-scientist who wanders into this weirdness – and lets the cast find their own takes on that and how they spark off one another. In contrast to the more deadpan and play-it-straight performances of the original, everything here is louder and brasher. If that tone shift doesn’t work for you, it will put you off. It didn’t bother me much, even if I like low-key better. The movie is at its best when it just lets them be weirdos in a weird world, and the movie lives and dies by how those scenes land. If you find the performances grating, you aren’t going to have a good time. That is because the rest of the film is just kind of there to hit the beats and that’s it. The plot is serviceable, but doesn’t bother to really flesh things out too much. It has a couple of good ideas, but is pretty paint by numbers big studio, even trying to shove in an unearned emotional beat between Wiig and McCarthy that looks like a subplot that may have ended up on the editing room floor. (A late scene with the villain controlling the bodies of the police and military also looks like a set up for a payoff that ended up cut from the main film, as the credits show.) The effects are good in a goofy way, and the set pieces are fun (the rock concert has some good moments in particular) but the last one does feel like justification for the CGI budget and someone told them they needed an action scene in the third act. The supporting players don’t have anyone as compelling as Mr Peck from the original and the fan service cameos are cute but don’t add a lot, but everyone does a decent job. The villain is a bit of a wasted opportunity, as Neil Casey does what he can with an awkwardly written part, but it is more Ghostbusters II in that regard. The *idea* of the villain is a good one, but being a little less on the nose with it would have helped. In the end, the film is a bit too intertextual for its own good. It knows it is a reboot of the original, and is just a little too concerned with working in references. It knows it had internet backlash, and works that into the story. It knows it comes in pre-judged, and tries a little too hard to disarm that instead of finding its own way. It never quite finds its wings and soars, but it does find its feet and strides. It’s fun to watch when it is just being weird and funny. I don’t think it will become the beloved property the original did, it is a little too cookie cutter for that, but I did have a good time watching some funny people just riff on each other. That’s pretty good for a summer comedy, which is all this movie should have to be.